Nghe An is a large province in the central part of Vietnam that connects the North to the South. Nghe An shares its border with Thanh Hoa in the north, East Sea in the east, Laos in the west, and Ha Tinh in the south. Nghe An is located on the North East of Truong Son range, with complicated topography, divided by hills, mountains, rivers and streams slanting from North-West to South-East, the highest peak is Pulaileng (2,711m) in Ky Son district, the low areas are Quynh Luu, Dien Chau, Yen Thanh districts and the lowest one is Quynh Thanh commune in Quynh Luu district with the altitude of 0,2m above the sea level. Mountainous and hilly lands cover 83% natural area of the whole province. The province is located in the tropical monsoon area, directly affected by the South West hot dry seasonal winds (during April- August) and the North East wet and cold seasonal winds (during November- March). The annual average temperature varies between 23 - 24oC. Nghe An has enjoyed favourable conditions in terms of geographical location. The province has the national highways and railway, as well as the Cua Lo International Port and Vinh Airport. Nghe An marks the starting point of the Heritage route in the central part, and the legendary Ho Chi Minh Trail. 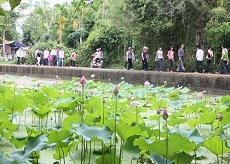 In addition, it is also the starting point of the tourist route following the east-west corridor, connecting Vinh- Laos- Thailand through Highway No. 8. Two thirds of its area is forested. Nature has endowed Nghe An with beautiful landscapes for tourism development. Among them include its long seaside with pristine beaches, especially Cua Lo which is considered one of the best in Vietnam, and Pu Mat National Park, which is home to diverse flora and fauna, apart from breath-taking landscapes. Nghe An takes pride in its tradition in the building and defense of the nation. One hundred and thirty-one historical-cultural sites have been recognized as national treasures. The Kim Lien historical-cultural site, the native village of President Ho Chi Minh, World Cultural Celebrity and National Liberation Hero, is one among those. Nghe An people have won kudos for their intelligence, diligence, eagerness to study and their hospitality, cultural traditional imbued with national identity. Nghe An is fast changing with every passing days. It will be a highlighted destination for tourists near and far. Nghe An is one of the important clue of transportation throughout the country. It has diversified and developed transportation, including land road, railway, river road, air port and sea port which are formed and scattered quite reasonably by residential zone, economic and administration centre. Road: highway 7, highway 48, highway 46, highway 15... Vinh is 14km from Kim Lien Village, 16km from Cua Lo Beach, 139km from Thanh Hoa, 197km from Dong Hoi, 291km from Hanoi, 368km from Hue, and 468km from Danang. Railway: 124km (of which 94km North - South line, with 7 stations, Vinh station is the main station. Airway: Vinh airport, Vinh - Danang - Tan Son Nhat flight (and reverse direction). Seaport: Cua Lo port now for the 10,000 toned ship. It will be convenience for being the international clue.